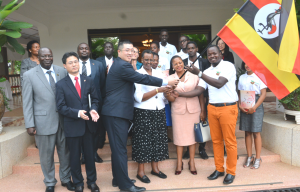 April 3, 2018—Ten talented students from selected Ugandan colleges and universities have been given a chance by technology firm, Huawei, to visit China and go through a two-week hands-on training stint under its “Seeds for the Future’ program. 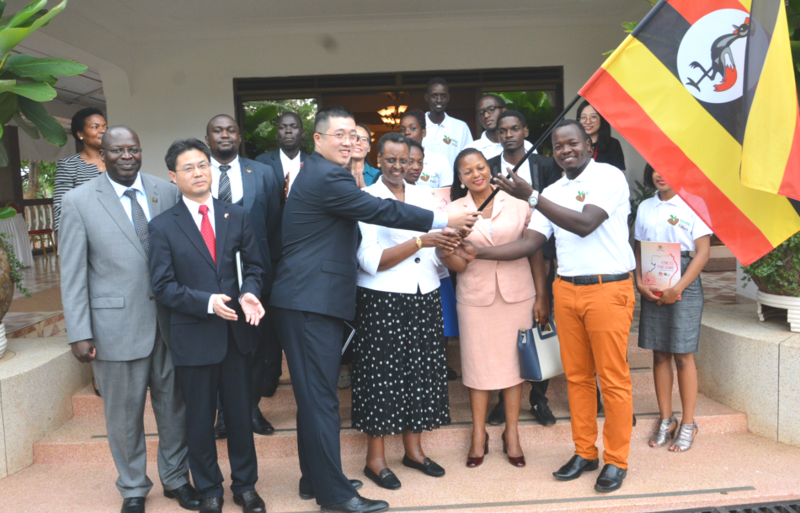 Mrs. Museveni (centre) and Ming jointly hand over the official flag to the leader of the group while Huawei’s Liujiawei (right) and others look on. Huwaei’s managing director in Uganda, Jerry Liujiawei said, “Huawei’s vision is to bridge the digital divide and make Uganda a better-connected place. In Uganda the program successfully started in 2016 with President Museveni flagging off 10 ICT talents to Beijing and Shenzhen. The “Seeds for the Future” is Huawei’s global Corporate Social Responsibility (CSR) flagship program that selects top college students in ICT-related courses for a technological study trip in China. Handing over a national flag to bid them farewell, Mrs. Museveni encouraged the successful students to maximize the opportunity and make the best of it to learn more and on return, to pass on the knowledge to others. The event was witnessed by the Chinese Embassy Charge D’ Affairs, Chu Mao Ming, and the Principal College of Computing and Information Science Makerere University Tony Oyana among others. The Huawei program has been implemented in 96 countries and international organisations worldwide benefiting over 30,000 students from 280 universities.